Motoring legend John Haynes - founder of the famous Haynes Manual car repair books - has died, aged 80. He was known across the world because of the extraordinary success of his books, which were bought and read by a staggering 200 million people. His family paid tribute to Haynes - saying he will be “missed enormously”. The first Haynes Manual, for the Austin Healey Sprite, was published in 1966 and the first print run of 3,000 sold out in less than three months. The idea to publish a manual for the average car owner was born after an RAF colleague, who had bought a Sprite in poor condition, asked John to help him rebuild it. John agreed, and then realised just how difficult the official factory manual was to understand and follow. He bought a camera and documented the process of dismantling and rebuilding the engine. The step-by-step photo sequences, which were linked to easy-to-understand diagrams, became the trusted hallmark of Haynes Manuals. Company chairman Eddie Bell said: “John will be warmly remembered by all at Haynes. His family also issued a statement, describing John as a “true gentleman, and a kind and considerate man”. John will be greatly missed not only by his family, friends and colleagues but also by the many people that use his manuals, and benefit from his reassuring guiding hand as they repair and maintain their cars and motorbikes. 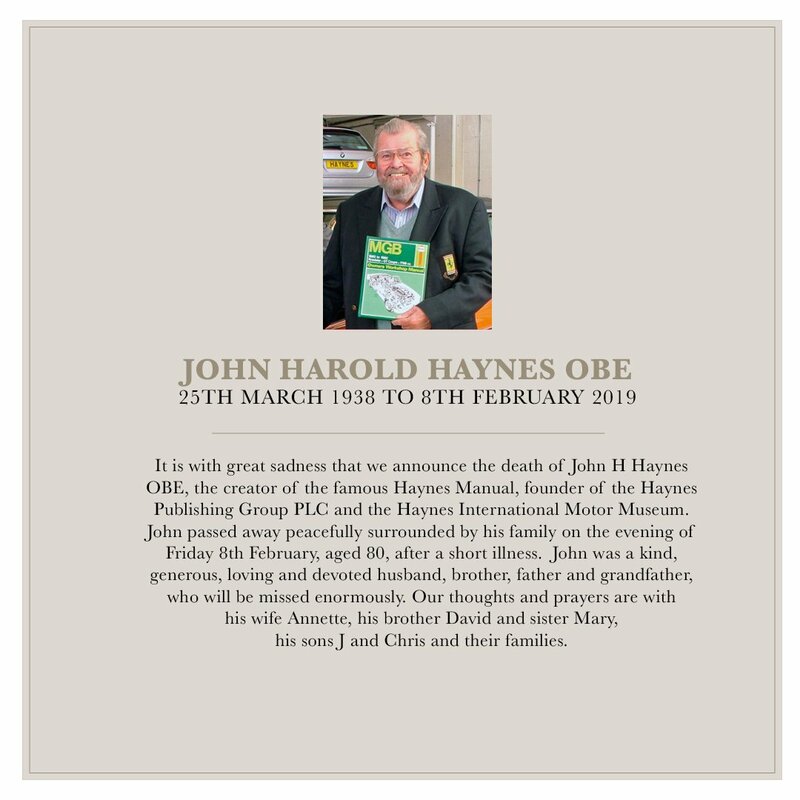 The success of his publishing business, which expanded into Europe and North America, saw the Haynes Publishing Group floating on the London Stock Exchange in 1979. In 1985, he founded the Haynes International Motor Museum in Sparkford, Somerset as an educational charitable trust. Haynes was born in Ceylon, now Sri Lanka, in 1938 where his father worked as the manager of a tea plantation. He loved nothing more than riding around the plantation with his father in their Morris 8 saloon, his obituary says. Alongside his brother David, Haynes was sent to Sutton Valence boarding school in Kent, aged 12. He convinced his housemaster to let him give up rugby and convert an Austin 7 into a more lightweight ‘sporty’ model, which the 16-year-old later sold for a healthy profit. He eventually sold the car, making a reasonable profit, and owing to the immense interest it received (over 150 replies to the advert) he decided to produce a booklet showing other enthusiasts how he’d made it. He published a booklet entitled “Building A ‘750’ Special’; the first print run of 250 copies sold out in 10 days. He joined the RAF for national service in the 1950s where he competitively raced cars, including his Elva Courier, which is on display in the Haynes International Motor Museum. According to legend, his rather unromantic wedding present to wife Annette - who met while serving in the RAF - was a second-hand IBM typewriter. Haynes International Motor Museum in Sparkford includes vehicles from different motoring eras, including 1930 Bentley 4 ½ Litre, 1973 E Type Jaguar, 1995 Dodge Viper and a 1995 Jaguar XJ220.